Have you ever felt like your workload is simply too much? Is your task list always current? Any deadlines approaching quickly? How about that Inbox...down to zero unread? Sometimes it feels...well...like we're surrounded. I don't like that feeling. Sometimes that feeling persists for days or weeks. I really don't like that at all. One way to deal with the self-induced stress that swirls inside our heads is to simply stop and breathe. I'm not talking about dropping into a downward dog pose, but literally to just stop what you're doing and allow your mind to take a break. We all spend so much time moving as fast as possible, caught up in a corporate world of unattainable stretch goals, loaded schedules and unrealistic expectations that we never simply stop. Stop. Take a slow deep breath and allow yourself a few moments. Trust me, the work will be there thirty seconds from now. Now you need to take the next step and get back in control. It's time to begin a daily ritual of using your task app and get yourself on top of the chaos. Starting each day with a quick review and re-prioritization of what needs to be done is essential. The symbolism is powerful here. Each day starts with you deciding what is going to happen and why. Sure, issues will come up and you'll have to make adjustments (that's called life); but overall you'll be driving the process. Do you allow yourself time each day to do your work? 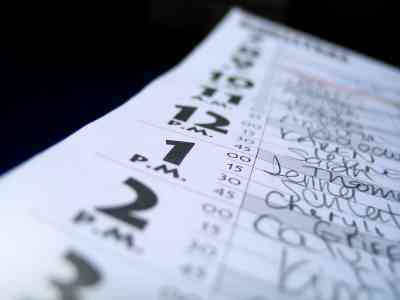 Or, do you allow your calendar to fill up with meetings? You're not a doormat, so stop acting like others can walk all over your day. Readjust your schedule, say no to some meetings, and send other team members in your place. Take action to preserve not only your sanity, but the quality of your work as well. Open your mental gates and attack! Stop feeling like you've been holding on for months waiting for relief. It's time to take the offensive on the lists, and projects, and expectations laying siege to your state of mind.